Hello, friends! It's ANYTHING GOES week on the Simon Says Stamp Wednesday Challenge blog! Yup! It's your favorite! The Design Team is showcasing Prima products this week. I chose some fun beads to work with and I kind of love them! I combined the beads with the GORGEOUS April Card Kit from Simon Says Stamp. You guys, for REALS, this kit is amazeballs! I love it! 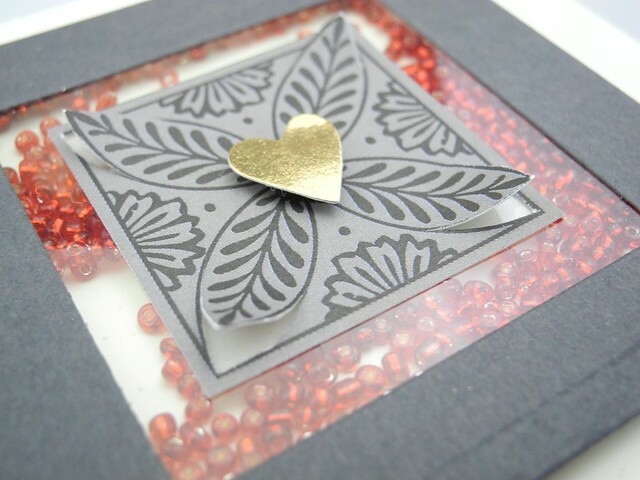 Gorgeous papers, perfect cardstock colors, and that gold heart? Totally a sticker. LOVE. IT. I made the shaker double width (two layers of foam tape) to be sure the beads could move around freely, but I also put LOTS of beads in there. It's a happy shaker! Now it's YOUR turn! One lucky participant is going to win a $50 Voucher to the Simon Says Stamp Store! Simple create something NEW and link it up for your chance to win! You can enter up to five times! Woot! Woot! Love your idea to show off this tiny medallion at the center of your shaker, Jennifer! Very pretty design! WOW! Gorgeous, Classical shaker card! Beautiful! What an elegant shaker! Super cool card! I love the beads in the shaker!! I really HAVE to get some!! And who knew shaker cards could be elegant?!? Awesome! Beautiful card Jennifer!! Fun and pretty at the same time!! Such a beautiful and unique shaker card! I love the beads and the colors are beautiful! It at first you don't succeed - try again!!! You disappeared when I first tried to leave a comment. I just love this card Jennifer, a fabulous design, brilliant use of the kit and gorgeous amber beads with the shaker element!! Fun card, Jennifer! Love the shaker element! LOVE this fun shaker! Beautiful card.